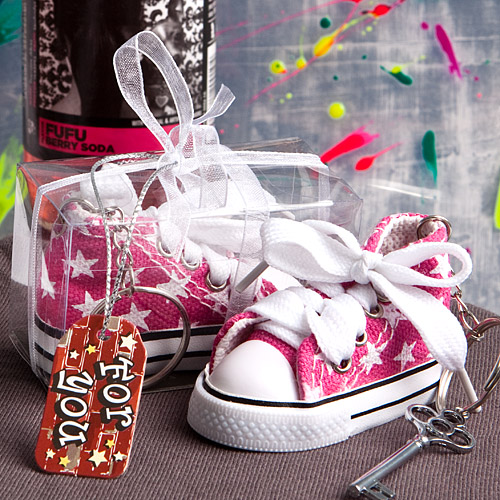 Hit the ground running with these he hi-top sneaker key chains. They are perfect as a graduation or Bar/Bat Mitzvah favor and will be enjoyed by kids and adults. Each hi-top sneaker measures 2.75" x 1.75" and is 4" long with chain. With your choice of a blue or pink background with with stars, stars, each mini sneaker is made of canvas with real white laces. As part of the design it also has a white rubber base and toe cap with black pinstripe accents and a brown rubber sole. 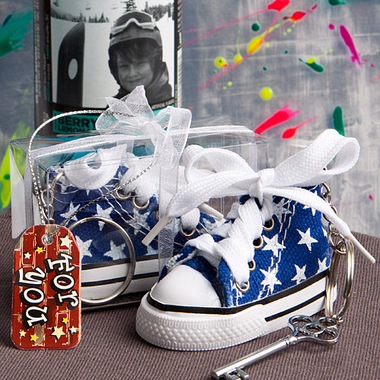 Attached to the sneaker is a sturdy silver metal chain and ring. For a graduation, you could place a sign near the favors with the words: Stepping Out in the World, Going Places, Hit the Ground Running, Your Future Awaits, Get to Steppin', A Journey to the Finish Line or add a quote. Here is a perfect one by Dr Seuss "With brains in your head, and feet in your shoes, you can go any direction you choose." Long skeleton key in photo not included.